I hope you had a good summer. I am back from interesting travels in Alaska, Spain, Poland, and Israel. At the Dioxin 2014 meetings in Madrid, 120 international scientists signed the Madrid Statement on fluorinated chemicals documenting the persistence and toxicity of many members of this class of chemicals. In Israel, I’m helping prevent the increased use of flame retardants. During my book tour for the Polish edition of Annapurna: A Woman’s Place, I was delighted to meet Polish climbers I’d first met in the 1970s and dozens of enthusiastic young Poles who lined up for personally signed books. Other Annapurna team members and I will be speaking at the Oakdale Climbing Festival next month. On another note, the Green Science Policy Institute and I are receiving great recognition for our work to reduce toxics and protect health including the 2014 Benjamin Ide Wheeler Medal given since 1929 to Berkeley’s “most useful citizen.” Please join me at the October 9, 2014 Berkeley Community Fund’s High Hopes Dinner, where I will receive the Wheeler medal. Tickets can be purchased here. I am so very honored that my alma mater Reed College has selected me for the Thomas Lamb Elliot award for lifetime achievement. This is presented each year to one Reed graduate who exemplifies the qualities of intellectual rigor, independence, and integrity. I was also inducted into the Alameda County Women’s Hall of Fameand, for fun, enjoyed the newly declared ‘Arlene Blum Day’ last May in Berkeley. 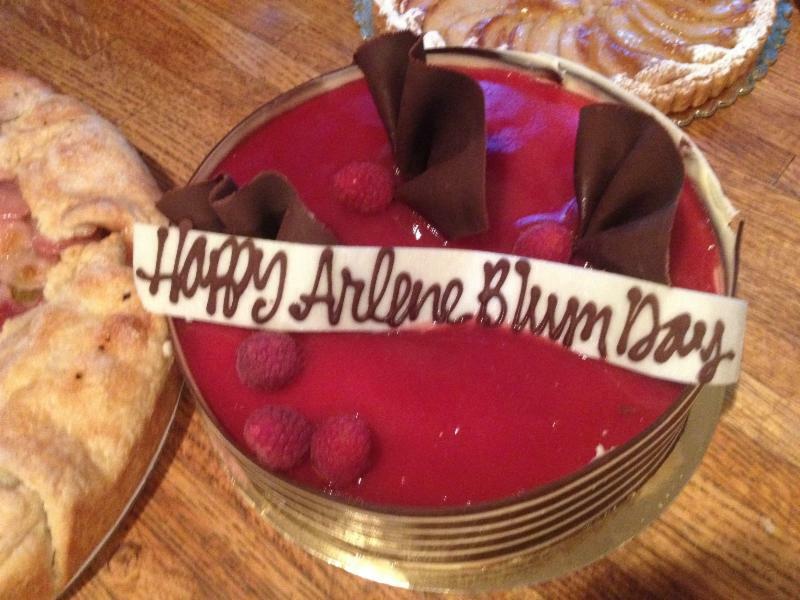 Thanks to Annalise for the delicious chocolate raspberry cake in the photo! You can now rent Toxic Hot Seat, Kirby Walker and James Redford’s riveting documentary about the harmful flame retardants in our furniture here. And the great news is that they no longer need to be there. If you would like to learn more about our work for a healthier planet, click here to view our website and here for our classic news articles and videos. The push to rid our bodies and the environment of toxic flame retardants just got a boost from Kaiser and four other health care systems who announced they will stop buying furniture treated with these chemicals. You can read more here (by Lynne Peeples in the Huffington Post). We are conducting a massive clinical toxicological trial, and our children and our children’s children are the experimental subjects. The Chemical Brain Drain website states: “Today, one out of every six children suffers from some form of neurodevelopmental abnormality…. Some environmental chemicals are known to cause brain damage and many more are suspected of it.” A recent review of 24 peer-reviewed studies found that low levels of maternal exposure to flame retardants and other environmental contaminants impacted children’s cognitive and behavioral development. Read the abstract here. A worrisome study reported in the San Francisco Chronicle finds that California’s brown pelicans aren’t breeding. These birds, nearly driven to extinction by DDT a half century ago, are in trouble again. Could chemicals in the same family as DDT (such as PCBs and flame retardants) be contributing? pathogens, which could help explain the mysterious disappearance of amphibians. You can read more here (by Veronica Chin). Do We Need Flame Retarded Killer Whales? 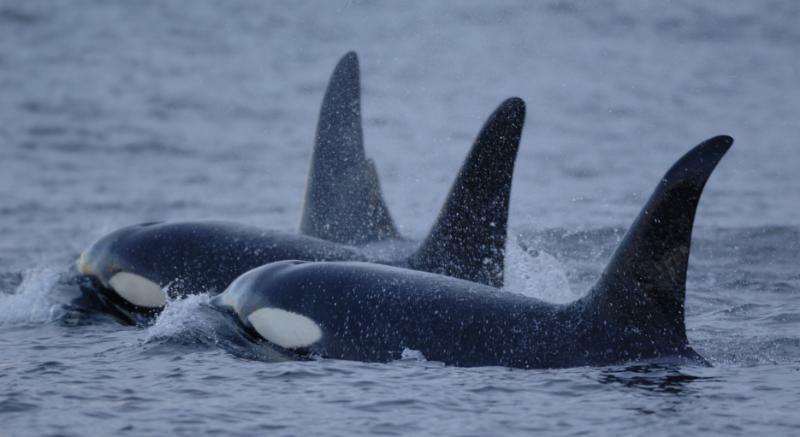 In the article, “Fireproof killer whales,” Dr. Peter Ross, writes about the adverse impacts of polychlorinated biphenyls (PCBs) and flame retardants on killer whales. Male killer whales are more contaminated than females who transfer part of their chemical burden to their calves through the placenta and breast milk. You can read more on our blog. If you are saddened by the news above, the good news is that we know that many of the harmful chemicals in products are in SixClasses; their use can be reduced, and we can all be healthier. October 9, 2014: Berkeley Community Fund’s High Hopes Dinner where Arlene will be presented with the 2014 Benjamin Ide Wheeler Medal given since 1929 to Berkeley’s “most useful citizen.” The High Hopes Dinner supports four-year college scholarships and mentoring for talented and resilient Berkeley High School students. Tickets can be purchased here. October 13 – 14, 2014: The Society of Fire Protection Engineers’ Annual Engineering Technology Conference in Long Beach, CA. Avery Lindeman will address California’s changing furniture flammability standard and potential changes to code requirements for plastic foam insulation. More information here. October 16, 2014: Arlene will speak at the third American Institutes of Architect, Central Valley Chapter Experience Architecture Week at 5:40 PM at The Crocker Art Museum in Sacramento. Click here to learn more and to register. October 17-19, 2014: Arlene, along with Irene Beardsley and Annie Whitehouse from the 1978 Women’s Annapurna expedition will speak at Oakdale Climbers Festival More information here. October 22, 2014: Arlene will be a panel speaker at the 5th Safer Consumer Products Summit in San Francisco. SAVE THE DATE February 13, 2015: The next Flame Retardant Dilemma Symposium will be held at UC Berkeley, California on February 13, 2015 from 8:30 am to 4:00 pm in 150 University Hall. Contributors from academia, industry, government, and citizens groups will share information on flame retardants and flammability standards. Write veronica@greensciencepolicy.org to receive registration information when available.